Cattle play key role in their everyday life. Milk is used for making butter and ghee (semi fluid clarified butter). Meat is eaten only when the animal dies or is being sacrificed. Skins, horns and bones are used for mats and drum skins, belts, ropes and other practical and decorative items. Dinkas use cattle's urine in washing, dyeing hair etc. Dung is not wasted either. It is used as fuel to make fire. Ash created has several purposes. Dinkas use it to clean cattle and keep them safe from parasites. They find ash useful for themselves too - mainly as kind of tooth paste and also in body art. Each member of the Dinka nation needs to know his or her ancestry because clan members living in the same region can not marry. Ancestry also plays an important role in the initiation of boys to warriors. The initiation is done when boys are 10 to 16 years old. The ceremony is held sometime around the harvest season. Before the initiation boys' hair has to be shaven. The boy being initiated is called a parapool – „one who has stopped milking“. This means that he does not have to do milking, gathering dung and similar jobs. 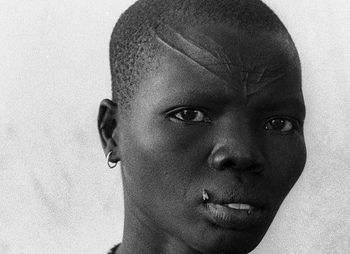 During the initiation itself tribal marks of several parallel lines or V-shaped marks are made as small cuts onto the boy's forehead. By becoming a warrior he protects village from predators and enemies. Wedding and cattle are closely associated too. Groom's family gives cattle to the bride's family. This is main way for the family to become wealthy. That is why the birth of a baby girl is celebrated too. 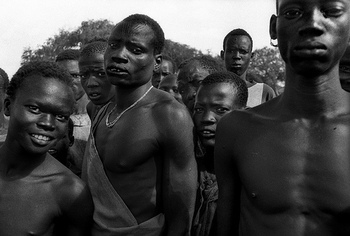 Still for every Dinka is the most important to get male child to maintain male clan lineage. If a man dies before his wife a brother or close relative will take the widow as wife. The children born in this relationship will be treated as those of the dead man. 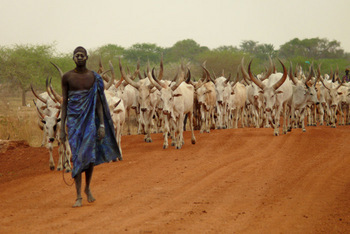 Dinka people are sometimes noted for their height. Let's just mention the example of ex-NBA player Manute Bol. He's 2.31 m tall.